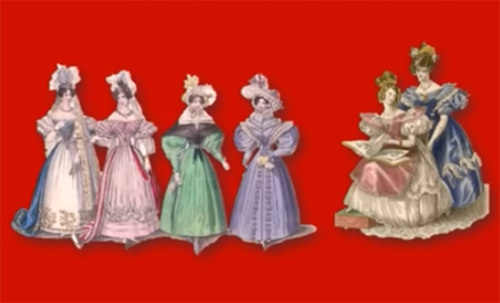 Doll-like female fashion of the 1830s-1840s. Why is that so? The mid-19th century is the end of the era of the Industrial Revolution – transition from hand production methods to machine manufacture. This period in European history is rather complicated and connected to very hard labor. And as fashion is always a response to the happening events, lifestyle, and social activities, the 1830s-40s’ fashion reflected the Industrial Revolution. Let’s see what we’re talking about. 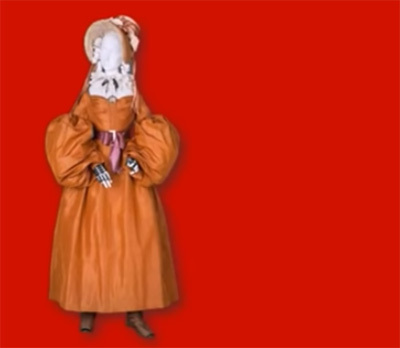 Let’s take a closer look at male and female clothes of this period. In the 19th century, society was focused upon the quick acquisition of wealth and the accumulation of property. The role of women was suppressed to that of “property”; a wife was the “property” of her husband, daughters were the “property” of their fathers, etc. And so, of course, fashion responded – with a very doll-like, infantilized look. The waistline drops, but not all the way down to the waist. This is not “Empire”, but it's certainly not at the waist. It's about halfway up, giving a very childlike look to the torso. And also note the ankle-revealing skirts. But unlike in the late 1700s, the shorter hemlines were not about sexiness or flirtation; they simply added to the childlike, doll-like look of the 1830s. The Nouveau Riche were “living large”, so the silhouette responded. Just take a look at this silhouette – it is so wide, so large. First, she had her underpinnings (a corset, pantalettes, and a “crin” petticoat). It wasn’t a crinoline yet; “crin” is horsehair, so this was a thick petticoat made of a textile that incorporated horsehair to make it very stiff. It would hold the shape of the gown. Then, of course, she had her sleeve plumpers. The flat little ankle boots are next. Over the undergarments, went her gown, over which went her massive pelerine. And then, went her massive bonnet. Of course, all of her garments were adorned with plenty of decorations. 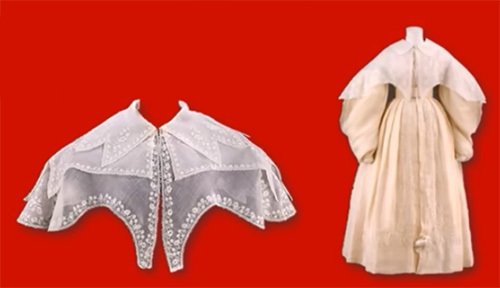 Let's talk about these extraordinary sleeves called “gigot sleeves”. The name comes from French. It is short for “gigot d’agneau”, which is the “leg of lamb”. The sleeves are called so because their shape is similar to the actual leg of lamb. How did they keep this shape? Well, by use of something called “sleeve plumpers”. 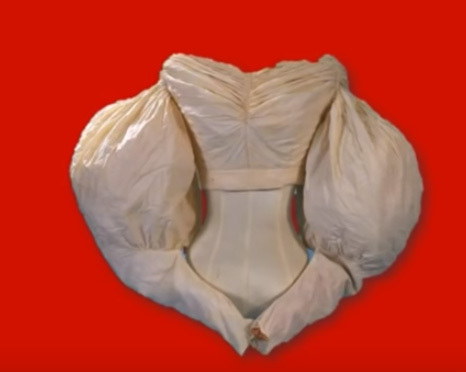 These were sacks filled with light, downy feathers that were attached to the corset to keep sleeves puffy, so that they would hold their extraordinary shape. Adding to the doll-like look was a large fichu that covered the shoulders entirely and was called a “pelerine”. In this period, adornment and embellishment equaled wealth. So much lace, so many ribbons, so many flowers and roses and feathers. The more crap you could put onto your attire, the more fashionable you were. 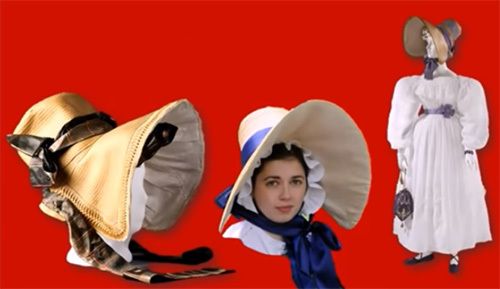 Bonnets were deep-brimmed; they had these very deep, very large funnel-like brims. They made the head very large, which, again, added to this childlike look. This really was an era when we see women reduced to infants and without a mind of their own. But not only did these big bonnets add to the childlike and doll-like appearance, but the deep brims “protected” women from seeing the ugly and awful realities of The Industrial Age. They were like blinkers on a horse. But also, it stopped the poor from seeing her. 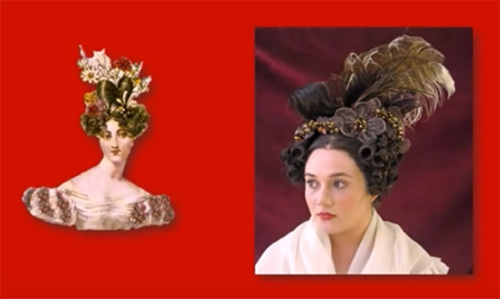 Hair in this era was, again, very doll-like and very embellished – lots of ornaments, lots of ringlets, flowers, feathers, ribbons. The more stuff you could get into your hair for the evening, the more fashionable and the wealthy you were. During this era, we have this very wasp-waisted look for men. Although the tail coat was still around, it starts to be replaced by the frock coat. And although everything is very sober, everything is still very much focused up on the neck. But also, men finally got to wear trousers. It is a very sensible, sober, and businesslike look for a man. 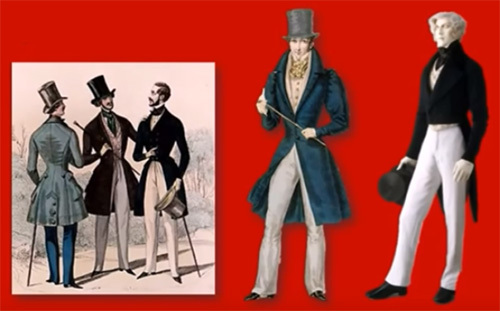 All of the men in this era are wearing top hats or toppers. They were nearly always black. Why? What do these top hats remind you of? Well, they are like these smokestacks, the chimneys on factories and the big steam funnels on steamboats and the chimneys on steam trains. 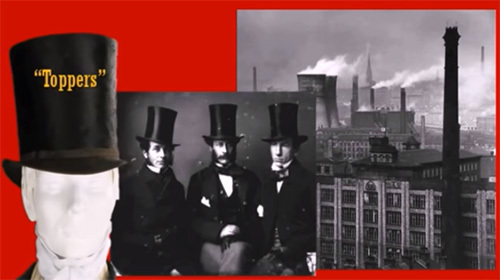 We’re not saying, of course, that every man who wore a top hat consciously thought, “Oh, I want to put a chimney on my head!” But it's obvious, this is what it was all about. 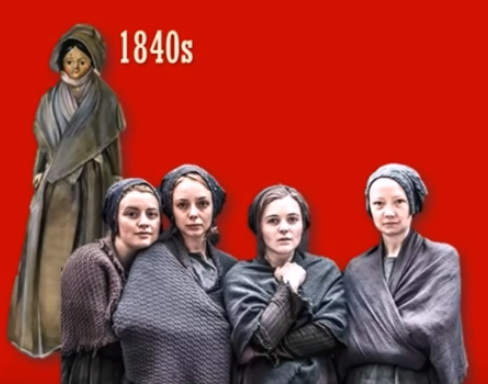 This is an illustration of a female industrial worker, a factory worker, a poor, impoverished woman of the 1840s. And there is also a still from a BBC costume drama which shows very authentically how industrial factory workers dressed. The 19th-century factory workers were instantly recognizable by their tightly wrapped shawls. They all had these shawls wrapped or tied very tightly around their bodies because they couldn't afford coats. And the bourgeoisie responded. 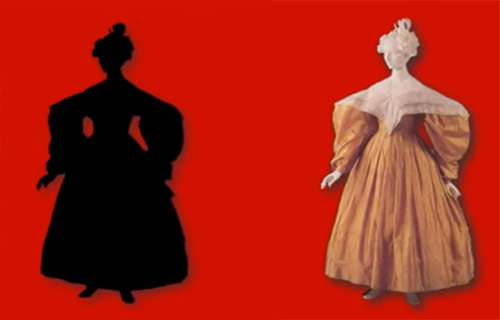 The silhouette of dress from the 1840s differ a lot from what we saw in the 1830s. The dresses had very tight sleeves, a longer and more modest skirt, and the shawl bodice. By the way, the number of adornments decreased to a few or none. Bonnets become far shallower in the brim. 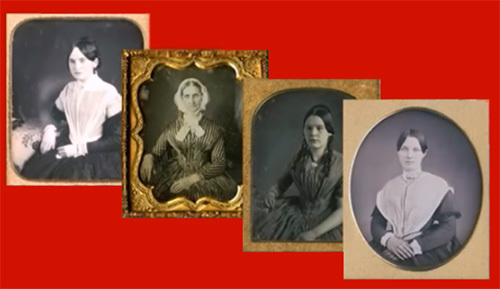 Here are some photographs of women in the 1840s, with this shawl-like bodice. And you can see in the first and the last picture that this shawl-like bodice has been accentuated with this new shape of pelerine, which is really like a shawl now, being draped tightly around the body.